Only 20 hours ago we have seen the spectacle of the lengths Dr. Brown will go to to defend his co-missionary, so called ‘rabbi’ Shapira of Ahavat Ministries which is a missionary organization of Shapira’s set up to convert Jews to Jesus/ Yeshua. 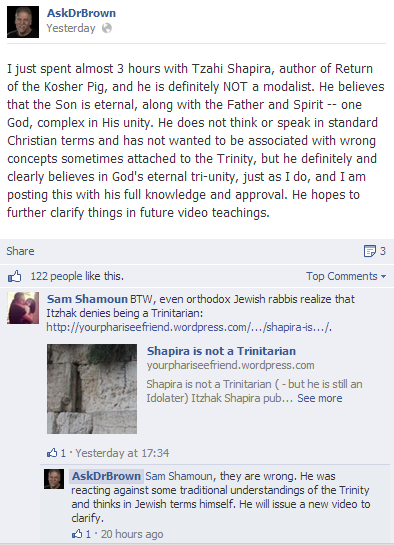 The defense of Dr. Brown is to say that ‘rabbi’ Shapira is not a Modalist. A Modalist is the non-trinitarian belief that the Heavenly Father, Resurrected Son and Holy Spirit are different modes or aspects of one monadic God, as perceived by the believer, rather than three distinct persons within the Godhead i.e Trinitarian. Is Shapira a Trinitarian? It makes no difference. As long as he directs worship to a man and encourages others to do the same then he has taken a stance against the very heart of what Israel stands for as a nation before God. Another question is: will we see another video from Shapira featuring his conversion to Trinitarianism in light of the me$$ianic fund$ drying up owing to his Modalism? Watch this space………….